As the stir for reservation in jobs and education intensified, the Maratha Kranti Morcha, which is spearheading the agitation, also decided to call for a Mumbai bandh on Wednesday. A constable died and another was injured in stone pelting on Tuesday as a state-wide protest called by outfits seeking reservation for the Maratha community turned violent with agitators classing with police and torching vehicles in Aurangabad and adjoining districts of Maharashtra. The outfit had called for Tuesday's Maharashtra bandh after the death of a protestor on Monday during a protest march in favour of reservations. The 27-year-old Kakasaheb Shinde, had jumped off a bridge over Godavari river in Aurangabad. He was rushed to a hospital where he was declared dead. Another protestor, 31-year-old Jagannath Sonawane from Aurangabad district, sought to emulate Shinde's example by jumping onto a dry river bed. He has been admitted to a government hospital in Aurangabad, police said. The Marathas, a politically influential community that constitutes around 30% of the state's population, have been campaigning for quotas in government jobs and education. Various Maratha organisations held massive ‘silent marches’ last year at 58 places across the state, demanding reservations in jobs and education, among other things. The Bombay High Court had in 2014 disallowed 16% reservation for them in government services and educational institutions. In 2003-04, the National Commission for Backward Classes rejected the demand for including the Maratha community in the category of Other Backward Class (OBC) category. The farming community, once well-off and hence averse to education and jobs, has been in jeopardy for long. Erratic monsoons, unfair crop pricing policies, lack of irrigation or insurance coupled with rising costs of lab¬ourers, fertilisers, pesticides and seeds have deepened the agrarian crisis. For years, the state has had an alarming numbers of farmers’ suicides, especially in the Vidarbha and Mara¬th¬wada regions. The children of Marathas, who may not have higher education, are staring at a loss-making future on the farm while Dalits and OBCs with quotas get government jobs. Whether it is in Ahmednagar or Kolh¬apur—wherever Marathas are not only predominant but also powerful—youth often speak of misuse of the Atrocity Act by Dalit groups. 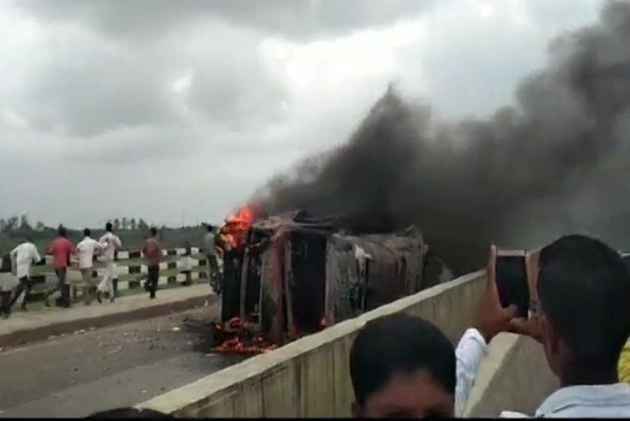 The protesters blocked the Aurangabad-Pune highway since Monday. Internet services were suspended in rural areas of Aurangabad to prevent any untoward incident. The Maratha Kranti Morcha had on Monday said they have called the bandh across the state on Tuesday and that they would continue their agitation until chief minister Devendra Fadnavis apologises to the community. Fadnavis alleged that some members from the community were planning violence at Pandharpur town in Solapur district, where the chief minister was earlier scheduled to perform puja at a temple on 'Ashadhi Ekadashi'. Fadnavis had said on Sunday that he was cancelling his visit, scheduled yesterday, to the temple in Pandharpur after protesting Maratha outfits threatened to disrupt the event. In the last few days, protests have take place in Buldhana, Akola, Parali, Washim and even in Mumbai.